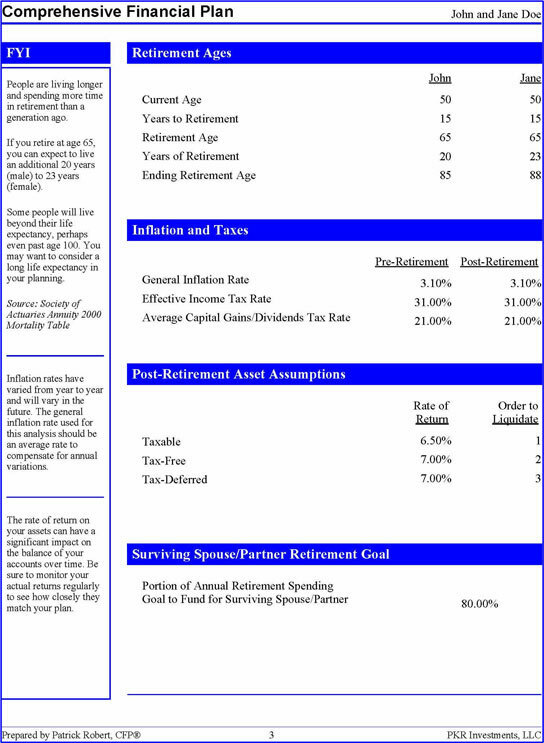 Cash Flow (Retirement Analysis) is the most popular Financial Planning Modules. It's a snapshot of your financial position and what you need to do to obtain your financial goals. The Cash Flow Analysis is a great tool in determining if your current assets are sufficient to support a specific financial goal, such as retirement. The analysis begins with a summary of your personal information such as a desired retirement age. Next, economic assumptions are determined based on current market conditions which will be used to fund your financial goals or retirement. Next is a detailed breakdown of your assets. This will be used to fund your financial spending goals. We then use all of the data gathered to determine how close you are to achieving your goals. The analysis tells us what percent of your goal can be achieved with your current assets and income. 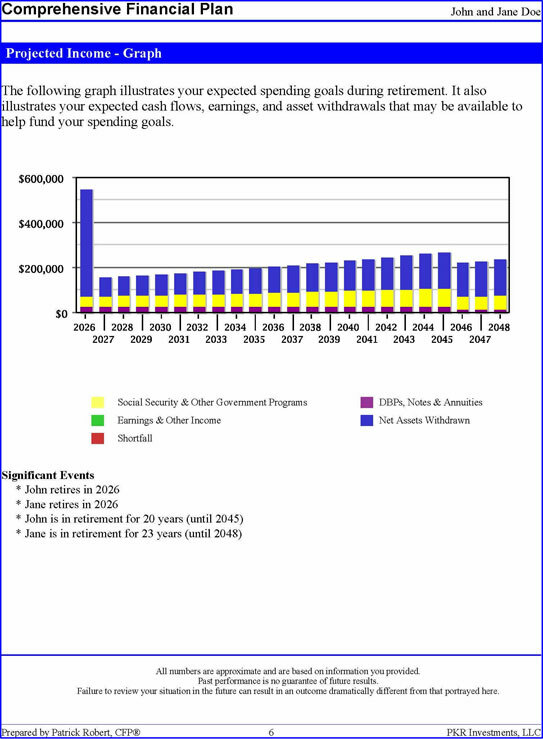 Below – “John and Jane Doe” have resources that could support 105.88% of their retirement, therefore, they have more than enough resources to achieve their financial goals. If the percentage is below 100%, the Analysis would then detail exactly what needs to be accomplished in order to increase it to 100%. A Cash Flow Analysis is a great way for you to determine how close you are to achieving a financial goal. This Analysis is especially helpful to people who are determining if and when they can retire and what can be done to move up their retirement date.